A business survives on knowing what its customers think of it; what product is important to them and will therefore sell. 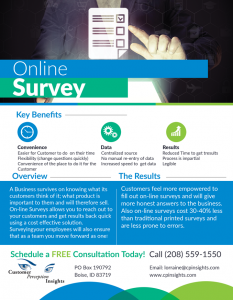 Online surveys allow you to reach out to your customers and get results back quick using a cost effective solution. Surveying your employees will also ensure that as a team you move forward as one! Customers feel more empowered to fill out online surveys and will give more honest answers to the business. Also, online surveys cost 30 – 40% less than traditionally printed surveys and are less prone to errors.